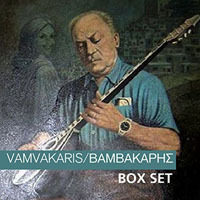 This romantic Greek Rebetiko song was written by Markos Vamvakaris (also known as Fragkos, because of his Catholic religion). The lyrics talk about a beautiful girl he saw on the Greek island of Syros during one of his concerts. He never knew or met this beautiful woman ever again. He sat down and just started pouring his heart and soul into the lyrics which came to be known as the song "Fragosiriani". The word "Fragosyriani" refers to the Catholic-born Greeks from the island of Syros. Frago = Catholic and Syriani = girl of Syros. In the lyrics, Markos' romantic fantasy travels throughout various towns of the island of Syros: Pateli, Foinika, Nihori, Parakopi, Delagratsia, Piskopio, Alithini. The legendary Markos Vamvakaris (in Greek, Μάρκος Βαμβακάρης) was born May 10, 1905 on the Greek island of Syros. Syros is located in the Aegean Sea. He was from a small village called Danakos. 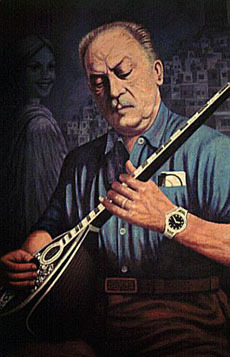 He is considered one of the fathers of Rebetiko music. The Hellenic (Greek) people, young and old, love this type of music. But there is also a love/hate relationship. You have to be in the mood to be able to welcome this music into your conscious body, mind and soul. Even though there are many songs that may sound upbeat, they are also heavy at the same time. But when the time comes for celebration, it has the opposite feeling. Feeling is no longer heavy, but rather joyous and nostalgic! "Fragosyriani" is in the musical style typically used for performing a folkloric line dance known as hasapiko. This dance was traditionally done by men, although today it is popular with both sexes. CAUTION: This song and other hasapiko music should not be used as part of a tsiftetelli (belly dance) performance. Although it would not be offensive to use it, a performer who did so would be viewed by Greek audience members as lacking cultural knowledge about what type of music is appropriate to what style of dance. She would lose credibility with the audience. A dancer could choose to include hasapiko music at the very end of a tsiftetelli performance, as music that would keep playing after she leaves the stage. It could serve as an invitation for the audience to get up and line dance. 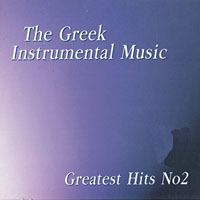 The song translation and background information about the music were written by Panayiota Bakis Mohieddin.